The complete solution to your post wax problems! for smooth and healthy looking skin following hair removal. combination of ingredients for a complete, effective solution. 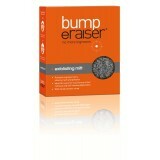 Bump eRaiser Exfoliating Mitt The Bump eRaiser Exfoliating Mitt is a must have in .. Concentrated Serum 125ml A no-sting treatment to calm red, itchy and sensitive ski..
Medi Paste 30g A highly concentrated spot treatment to prevent and eliminate ingro..
Caron Bump eRaiser Triple Action Lotion 125ml 3 in 1 ingrown hair treatment. 1..